Today, on the sixth death anniversary of Corazon Aquino, I am reposting two pieces I had written for my first blog shortly before and after her death in 2009. The first piece written after her burial is entitled “Noynoy, do the President’s shoes fit or are they too big?” At the end of the piece I described the kind of President the nation needs, even today. 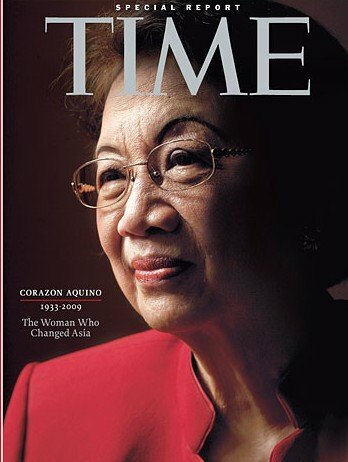 The second piece, written after President Gloria Macapagal-Arroyo had pulled out Cory Aquino’s personal security team even as she lay dying, is entitled – “The real security threat to President Arroyo is a grandma.” In it I point out the late president’s lasting legacy to the nation despite all the brickbats thrown at her. Noynoy, do the President’s shoes fit or are they too big? Yesterday as soon as I got up I flicked on the radio to find out whether, as Philippine Star columnist Wilson Lee Flores had predicted to me, his former macroeconomics teacher Gloria Macapagal-Arroyo would drop by Cory Aquino’s wake. She did and as I listened to the radio commentator describe the awkward event as “civil” with Cory Aquino’s son even shaking the President’s hand, something clicked in my mind. I can’t describe it, but while I don’t have an internal compass for street directions I seem to have one for political news. When I heard that, I felt some kind of invisible power had passed from Mrs Arroyo to Senator Aquino in that brief handshake – like magic. Mr Aquino had risen beyond his bitter feelings and made a statesman-like gesture, and had become bigger because of it. I must confess it was the first time I seriously considered him as a possible contender for the 2010 presidency. Before, when I met him during a Liberal Party convention he seemed to melt into the hotel furniture. From what other reporters told me, he was a laid-back sort of fellow and was not at all hungry for political power, like his departed mother. Considering the senator for the highest post seems to be a natural reaction after such a political death. Soon after his father Senator Benigno Aquino Junior was assassinated in 1983, people had flocked to the slain senator’s younger brother, Agapito “Butz” Aquino. But Butz quickly begged off saying, “his shoes are too big to fill,” little realizing they would be remoulded two years later to fit his sister-in-law. If I were a newbie reporter and Edsa People Power never happened I might even join the Noynoy bandwagon. What a romantic notion. But I am no longer one. Whereas I used to go all goo-goo and gaga-eyed whenever I met someone who declared he or she would like to become President of the Philippines, not anymore. I’ve met and talked to far too many men and women with that presidential twinkle in their eye: Jovito Salonga, Imelda Marcos, Raul Manglapus (+), Raul Roco (+), Eduardo Cojuangco, Juan Ponce Enrile, Eddie Villanueva, Heherson Alvarez, Ernesto Maceda, Edgardo Angara, Eli Pamatong, Aquilino Pimentel, Salvador Laurel (+) and a couple more whose names I don’t now remember. And I’ve covered five presidential elections. Through it all I’ve come to realize we Filipinos tend to regard elections like a race where the candidates are like the horses to bet on. Perhaps our elections can be viewed another way – like a long and exhausting job interview with we, the people, as the employer, the decider. When I first got my baby a yaya (caregiver), I drew up a list of qualities I wanted and weighed the applicants against this list. A president of a nation is equally important to me and so, permit me to share with you the qualities I’m looking for in the next president. 1. He/she must be a basically decent person, not necessarily always praying but not amoral. 2. He/She doesn’t have to be a Harvard University graduate or very young or from a political clan. 3. He/She must be a reformist president with a decided bias for uplifting the plight of the majority of the people who are poor, but with the ability to convince the wealthy that this will widen the consumer base for their products. It cannot be business as usual. It cannot be trickle down. 4. He/She must have a profound ingratitude to his powerful and wealthy donors and his own class. 5. He/She must have a definite plan of concrete action from day one on the following – poverty, corruption, insurgency and Muslim unrest. When a candidate is asked for his to-do list and he answers, “Watch me” or “Trust me,” that’s crap. Scratch him out. 6. At the same time, he/she must have the cunning of a dove, able to navigate his way through the political snake pit. 7. He/She must be skilled in conflict resolution. 8. He/she must be a leader, not just a manager. And must inspire the citizenry to initiate action on their own. So far, I haven’t seen a candidate who has these qualities. Do you, Noynoy? I smile whenever I hear that over 12,000 policemen and soldiers will physically secure President Gloria Macapagal-Arroyo and legislators this Monday when she delivers her State of the Nation address. Because the real threat to their security in office is a grandmother lying on her sick bed, agonizing in pain from colon cancer. Now some of you might be angry at me for bringing this up at such a delicate time. I believe Mrs Aquino would have it no other way. She herself has actually linked her personal pain with the country’s current suffering. On her sickbed, a month after surgery, she sent over a message during the June 10, 2009 rally to mark Independence Day. She could have just stayed silent and everyone would have understood. Perhaps Mrs Arroyo’s spin doctors might sniff that between housewife Aquino and the economist Arroyo, the latter has more accomplishments as president such as the highest GDP growth in decades. Mrs Aquino did have her failings as president, such as a watered down agrarian reform law that benefited her family and her inability to wield the vast powers of a revolutionary government to reform democracy. But one thing Mrs Aquino has done is to set a gold standard of behavior for the presidency. She has given the average Filipino the highly subversive notion that all Philippine presidents and politicians must be accountable to the people for their actions. That idea, I believe, is the biggest security threat to the Arroyo administration. The Poison Dwarf is stating the obvious. He and his UNA surely have the same ambition. All UNA has to do to stop LP is to go out and win the votes. PD, know what “fat chance” means? The billionaire and haciendero Binay is getting bad advice. Gutom na gutom. He obviously wants to stay in power and I wonder what the leftists will say about this. Ka Satur, Ka Teddy at Ka Neri Colmenares, ano po ang masasabi mo tungkol sa mga plano na ito ni Binay? Sobrang tahimik niyo po about Binay. Talaga bang “Bayan Muna”? Kapag nanalo ba si Binay ay magiging ‘ideyolohiya’ muna at saka na ang bayan? Ang bilyonaryo at haciendero na si Binay ay harap-harapan nang nagpapahayag na taliwas sa mga isinusulong ninyo pero bakit sobrang tahimik pa rin? Ito na ang panahon na sana maintrrbyu sila si Raissa. Napakahilig nila slna humarap sa tv at magpainterbyu sa radyo at pahayagan kaya sa ay makuhanan na sila ng komento. Nagtataka na rin kasi ang mga miyembro ng Bayan Muna sa nakakabinging katahimikan nila tungkol kay Binay. With ten moths left until the Presidential elections COMELEC appear to be sailing pretty close th the wind. OMR machines. Order placed for lease of 23,000 machines. PCOS machines. 82,000 awaiting refurbishment. Optional lease 70,000 additional OMR machines to replace PCOS Machines. Question, with 295 calendar days left until the election and no contract yet let for PCOS machine refurbishment is it tecnically/physically possible to refurbish 82,000 machines in that time period? Question, can the bidding, leasing, delivery, installation processes for 70,000 OMR machines be completed in much less than 295 days should the need arise? Are there really 70,000 OMR machines sitting in a warehouse somewhere?